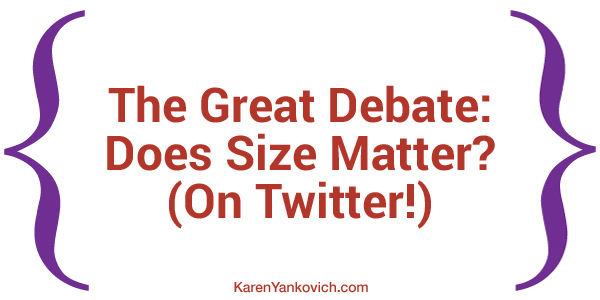 Last year I talked about how size matters on LinkedIn and now I want to talk about size on Twitter. Your follower size, that is. Number of followers and how much it matters is an interesting question that has been argued since the dawn of the first social media platform (officially that might be CompuServe or BBS circa 1980 – the first place online to truly meet and connect). Many articles will argue that having only 100 followers is fine if they are quality, meaning they are engaged with you, your business, and your posts and services. These 100 will discuss your business with their 100 friends and your reach will be organic and hold strong value for anyone in that circle due to the commitment of those 100 engaged fans. So the better question is: do numbers still matter if you have engaged fans? 3 reasons your numbers matter even if your followers are engaged. There’s a perceived level of influence in the numbers, like it or not. Every time I’m asked to speak or be interviewed, even on a podcast, people want to know how many followers I have. Getting those gigs increases my exposure, which brings me new clients and ultimately brings me new followers as well which starts the cycle all over again. From followers, to prospects, to clients, to more future gigs I now have a lead generating engine that will help me keep my sales pipeline full and always humming. Having a large number of followers gives me great impact, expert status and the most valuable of all – social proof that I know what I am talking about. This social proof of my status allows me to charge more and value my services at a higher price point. So even if I am not getting a direct lead my prices can increase with my number of followers and thus so do my profits. I like knowing that I can keep my revenue stream in the black because of this expert value. Holding webinars to explain what I do, educate when and where I can, and to sell my services is key for my business growth and probably for yours too. Regardless if my fans are engaged or not, the more followers I have the more people my webinar promotion posts (or other launch vehicle) can reach. I don’t need to buy an ad (though I still do at times) to gain some extra views, and the value of number of views is more important than engagement to gain one more webinar sign up. I have often found those that don’t “know” me yet are just as likely to sign up to see what I’m all about as those who already interact and buy. To recap: One of the best ways to grow your business is to gain the trust of your prospects and one of the best ways to do that is through the proof of numbers. To be deemed an ‘expert’ and ‘thought leader’ the prevailing statistic on Twitter is 5k-10,000 followers. I know that sounds like a lot when you feel stuck at maybe 50 or even 200. Check out my post on building your social media system to start gaining followers who are not just friends. It IS possible! I did it and I know you can too. Do you have a specific question about where to start on your march toward ten thousand? Join me in my LinkedIn Group and I will be glad to answer any questions you have! If it’s all about the numbers what are your thoughts on buying followers? I am constantly getting offers to buy but have declined. Do you see any value there? Yikes Mary Ann, no. I am going to update this blog post to talk about that! No, you DO want to have relevant followers. People who may be interested in what you have to say. Buying followers can quickly make you IRRELEVANT. As long as growing the platform authentically is a part of your marketing plan you’re way ahead of the game. No buying followers.